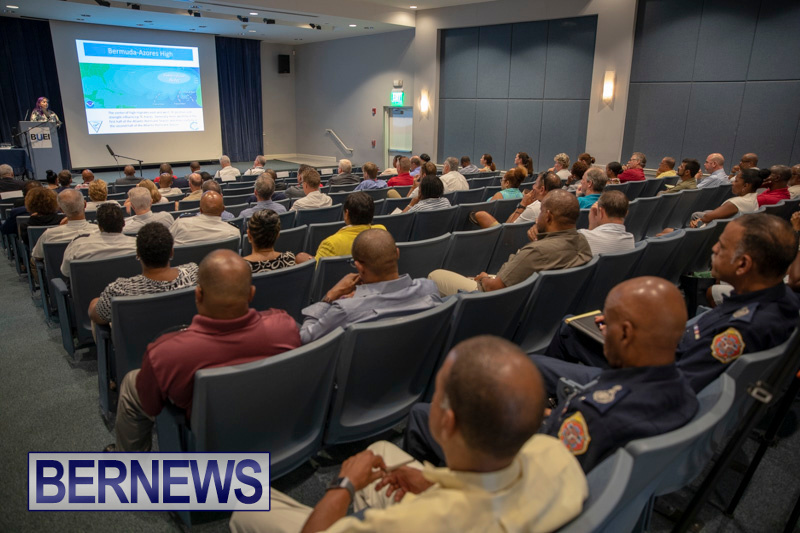 The Ministry of National Security, the Emergency Measures Organization and the Bermuda Weather Service hosted a meeting on Thursday [Aug 16] to provide an updated 2018 Atlantic Hurricane Season briefing to stakeholders. A spokesperson said, “Yesterday’s [August 16] EMO meeting was an opportunity for the Bermuda Weather Service to provide the latest hurricane season update to community stakeholders. “Present at yesterday’s briefing was the new Police Commissioner, Mr. Stephen Corbishley, the new Deputy Governor, Alison Crocket, and representing the Ministry of National Security was Senator Jason Hayward. The presentation was led by National Disaster Coordinator Steve Cosham and the BWS’s Director James Dodson and Meteorologist Michelle Pitcher.